The players in the $400 No-Limit Hold 'em Mega Stack Challenge event have returned from dinner break and cards are back in the air. 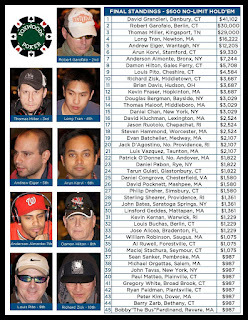 With 49 players remaining, the average chip stack is just under 90,000. This event will be played out in one day due to the impending winter snow storm. 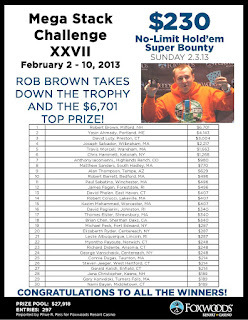 We had a total of 220 entrants in the $400 No-Limit Hold 'em Mega Stack Challenge event. Due to the impending winter snow storm, all events for Friday, February 8th, have been cancelled. All events tonight will be played, including the 6pm $150 No-Limit with a $15,000 Guaranteed prize pool. $400 Mega Stack Challenge Event Now Underway! The $400 No-Limit Hold 'em Mega Stack Challenge event is now underway. Players start with 20,000 in chips. Due to the impending winter snow storm, this event will be played out today. Due to the impending storm, the $1,200 Mega Stack Challenge Main Event, scheduled to start Saturday, has been cancelled. The magnitude of the upcoming storm is severe enough that the safety of both players and casino staff are a major concern. Therefore, the event has been cancelled. Due to the impending storm that is scheduled to hit tomorrow, the $400 Mega Stack Challenge is now going to be played out in one day. This will allow players to get home before the storm hits as opposed to having to come back tomorrow to finish out the event. 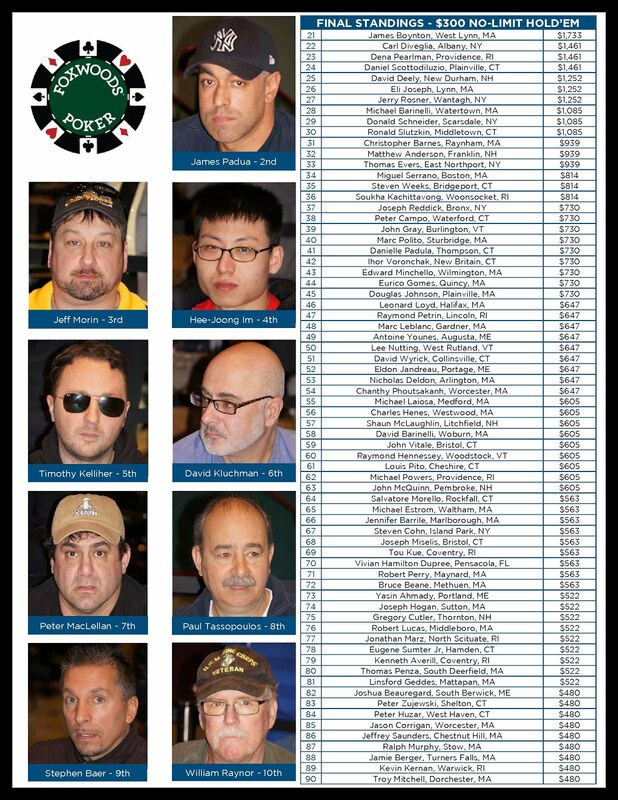 We had a total of 303 entrants in the $230 No-Limit Hold 'em Mega Stack Challenge event. 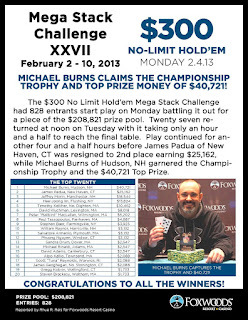 Michael Burns, winner of the $300 Mega Stack Challenge! 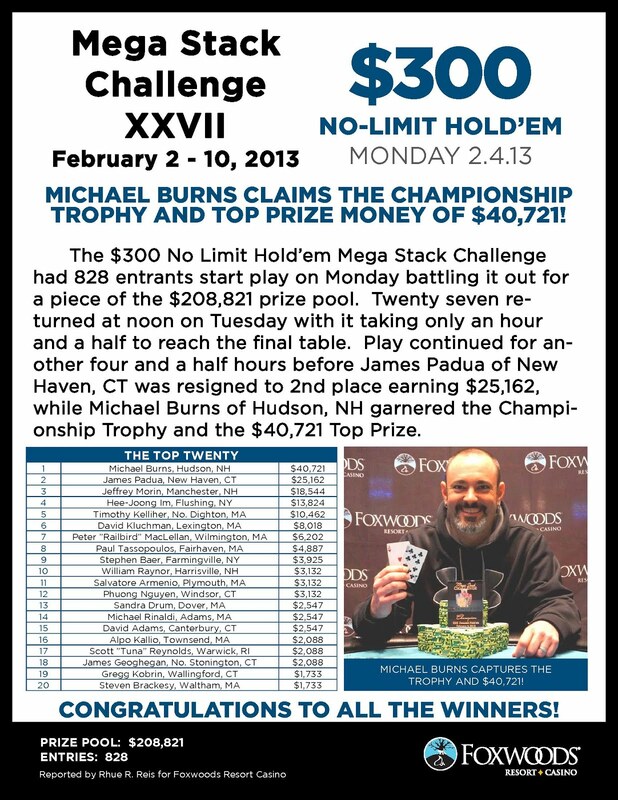 Congratulations to Michael Burns, winner of the $300 No-Limit Hold 'em Mega Stack Challenge event. 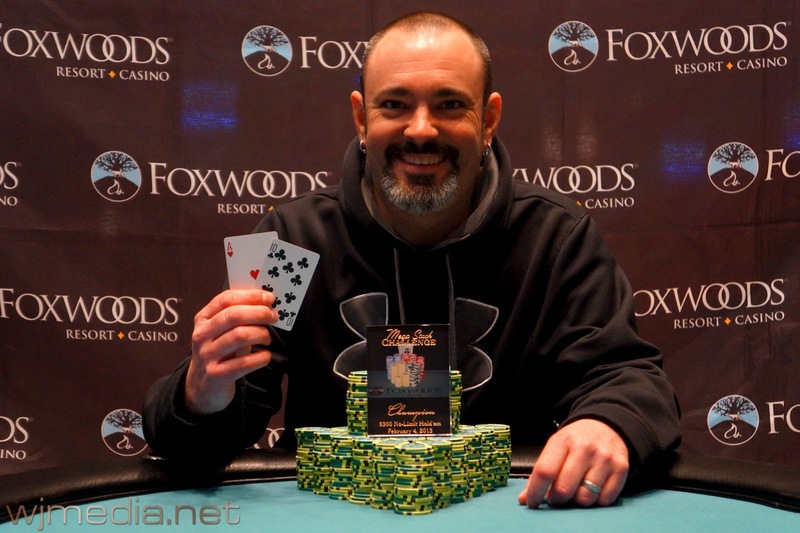 Michael takes home $40,721 plus the Mega Stack Challenge Trophy! A short-stacked James Padua moves all-in for just over 1.5 million and is called by Michael Burns. The board runs out [As][3c][3d][7c][7h] and Burns takes the pot with his better two pair. James Padua is eliminated from the $300 Mega Stack Challenge in 2nd place, taking home $25,162. Jeffrey Morin moves all-in for 2,305,000 from the button and James Padua calls all-in for 2,280,000. Chip leader Michael Burns thinks for a few moments before mucking pocket fives. The board runs out [As][9h][5c][5h][2h] and Padua takes the pot, leaving Morin with just 25,000 in chips. He was eliminated on the very next hand in 3rd place for $18,544. Hee Joong Im raises to 600,000 before the flop, leaving himself about 600,000 behind. Jeffrey Morin moves all-in from the big blind and Im calls all-in for the rest of his chips. The board comes [Kd][Qc][2h][Kh][Ad] and Morin wins the pot with trip kings. Hee Joong Im is eliminated from the $300 Mega Stack Challenge in 4th place for $13,824. Tim Kelliher moves all-in for his last 1,030,000 and is called by chip leader Jeffrey Morin in the big blind. The board runs out [Qh][5h][3c][6d][8h] and Morin takes the pot with his ace high. 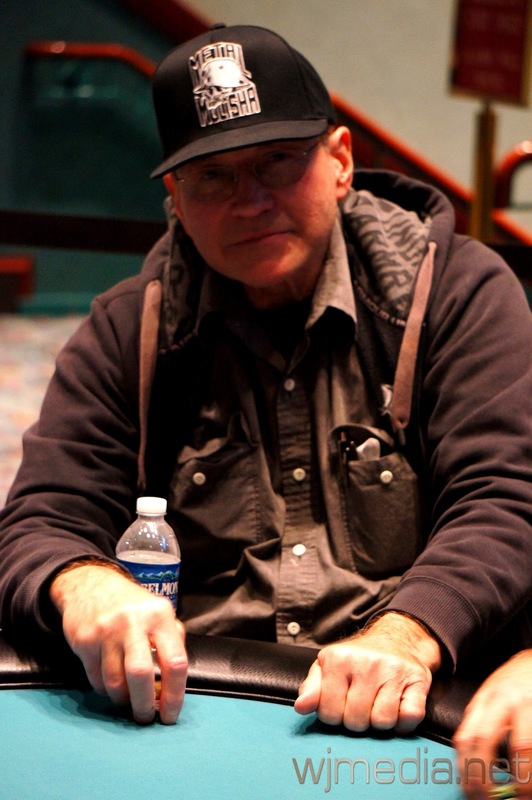 Tim Kelliher is eliminated from the $300 Mega Stack Challenge in 5th place for $10,462. Jeffrey Morin raises to 270,000 before the flop and David Kluchman moves all-in for 1,010,000 total. Morin thinks for a few moments before calling. The board runs out [Ac][Jc][4d][5d][Js] and Morin takes the pot with his pair of aces. 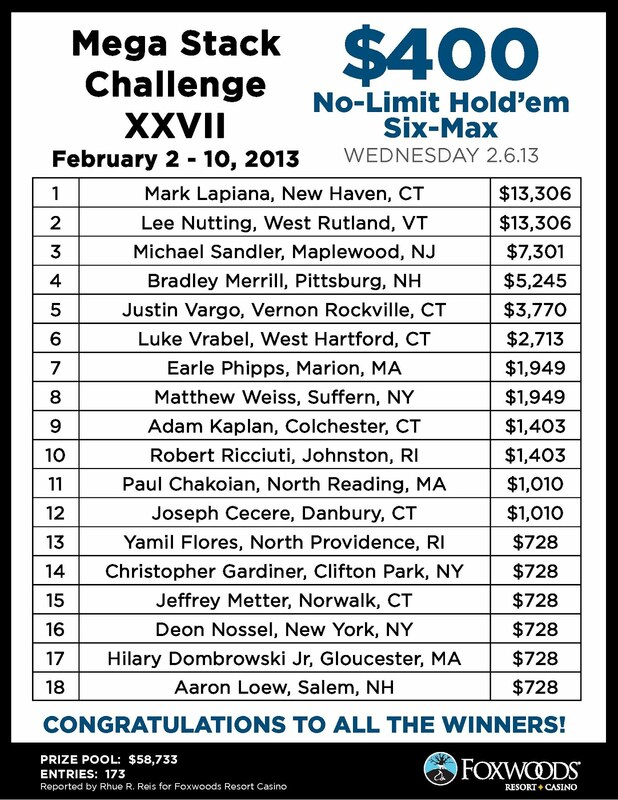 David Kluchman is eliminated from the $300 Mega Stack Challenge in 6th place for $8,018. Peter MacLellan raises to 240,000 before the flop and is called by Jeffrey Morin. The flop comes [Ac][8c][6h] and MacLellan checks. Morin, having MacLellan covered, announces he is all-in. MacLellan goes into the tank for about six minutes before making the call. The turn is the [9s] but the river comes the [3c], giving Morin the flush and the pot. 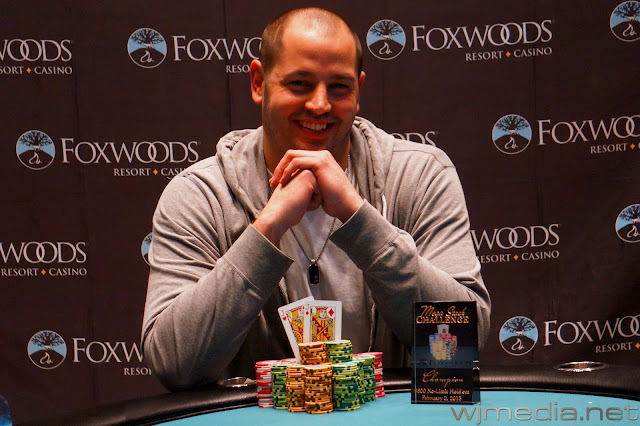 Jeffrey Morin is eliminated from the $300 Mega Stack Challenge in 7th place for $6,202. 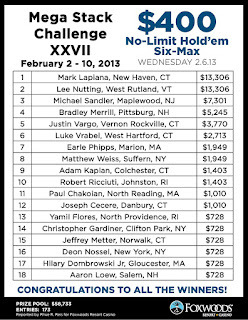 We had a total of 173 entrants in the $400 No-Limit Hold 'em Six-Max Mega Stack Challenge event. 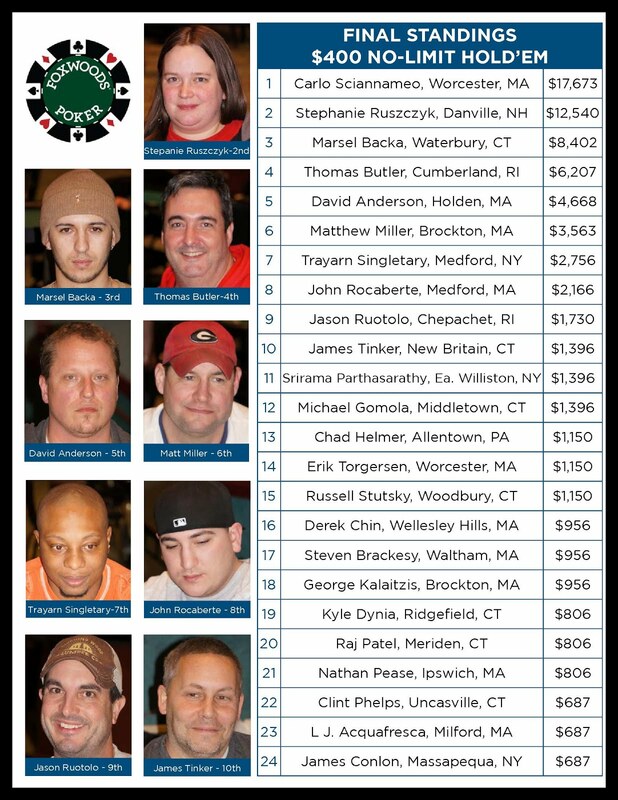 The action has been fast at the $300 No-Limit Hold 'em Mega Stack Challenge Final table. We have reached the final table of the $300 No-Limit Hold 'em Mega Stack Challenge event. The blinds are 25,000-50,000 with a 5,000 ante for another 6:39. Day 2 of the $300 Mega Stack Challenge Now Underway! Players have returned for Day 2 of the $300 No-Limit Hold 'em Mega Stack Challenge. 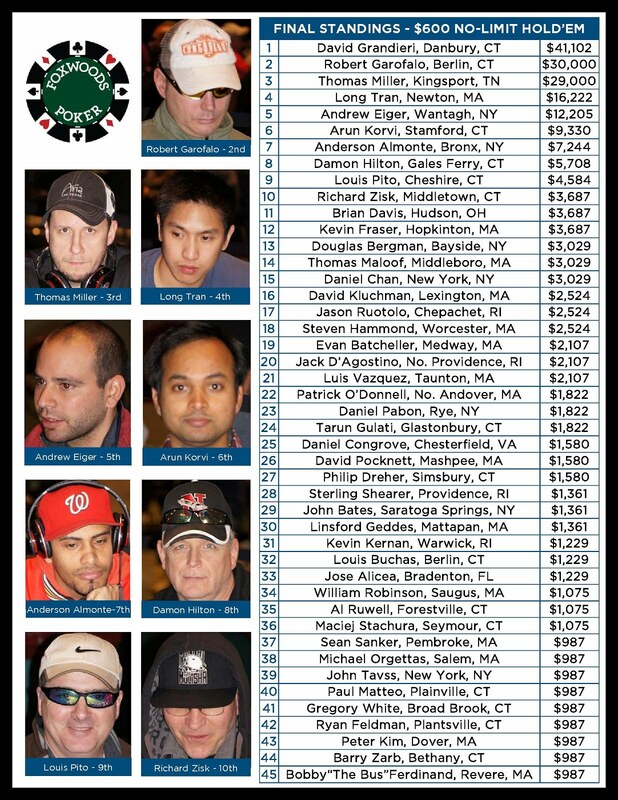 With 27 players remaining, the average chip stack is now 460,000. 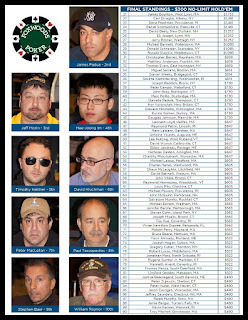 The blinds will be starting today at 15,000-30,000 with a 5,000 ante. 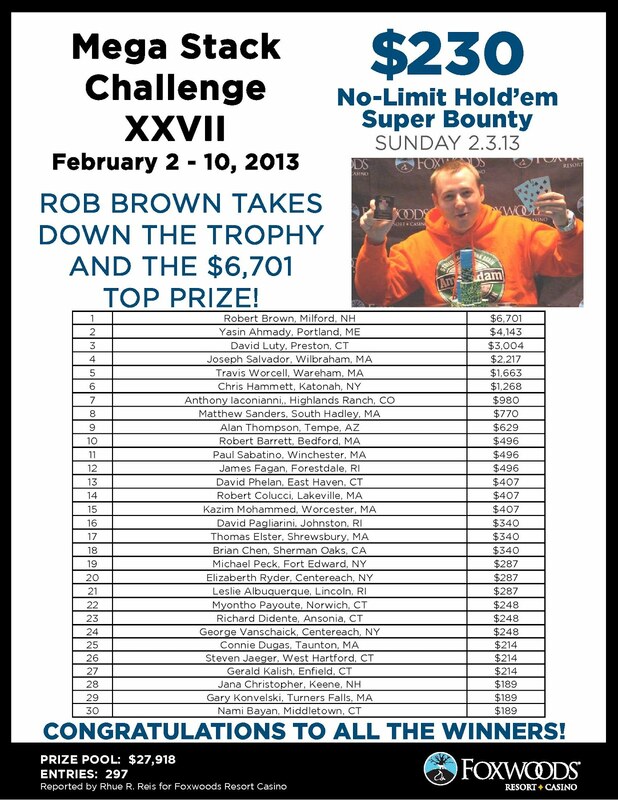 We had a total of 828 entrants in the $300 No-Limit Hold 'em Mega Stack Challenge event. 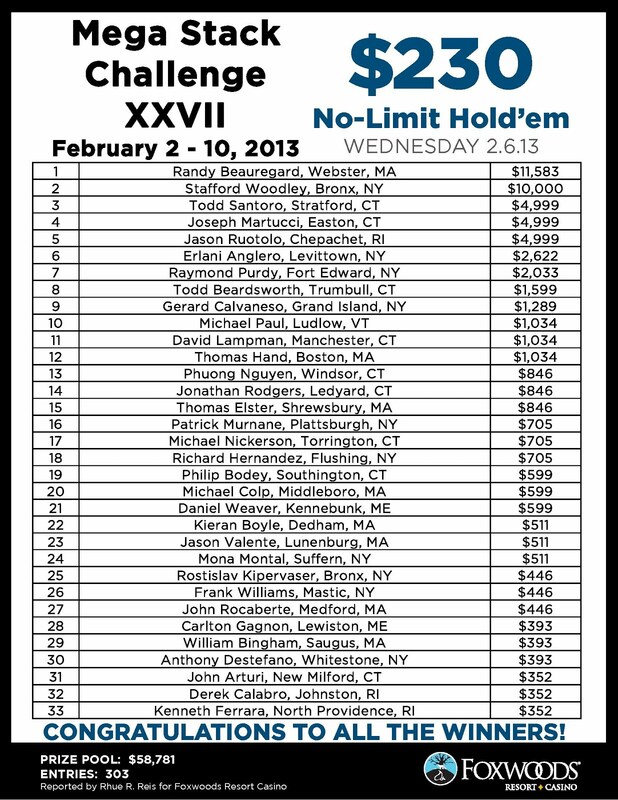 The players in the $300 No-Limit Hold 'em Mega Stack Challenge are just returning from their first break of the day. 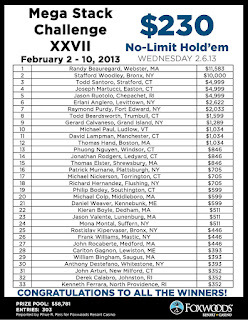 With registration open for another two levels, there are already 744 runners in today's event. $300 Mega Stack w/ $100K GTD Now Underway! The $300 No-Limit Hold 'em Mega Stack Challenge event is now underway. You may re-enter this event through the first six levels. 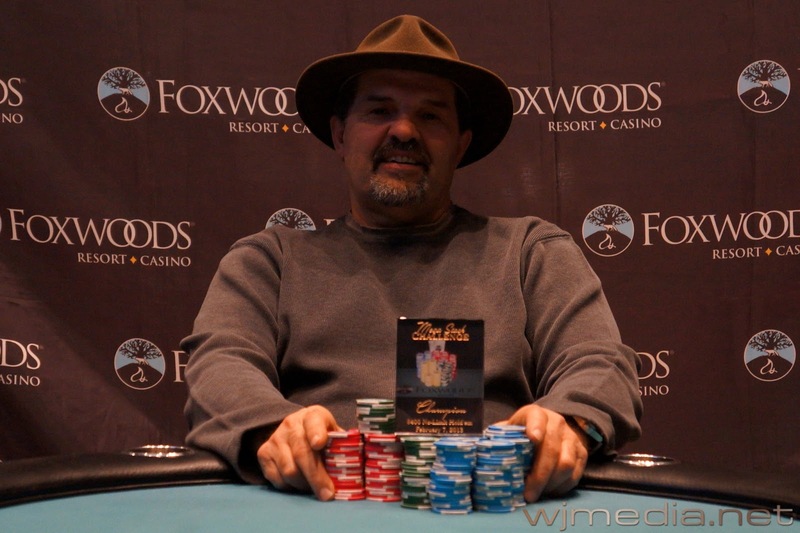 Dave Grandieri, winner of the $600 Mega Stack Challenge. 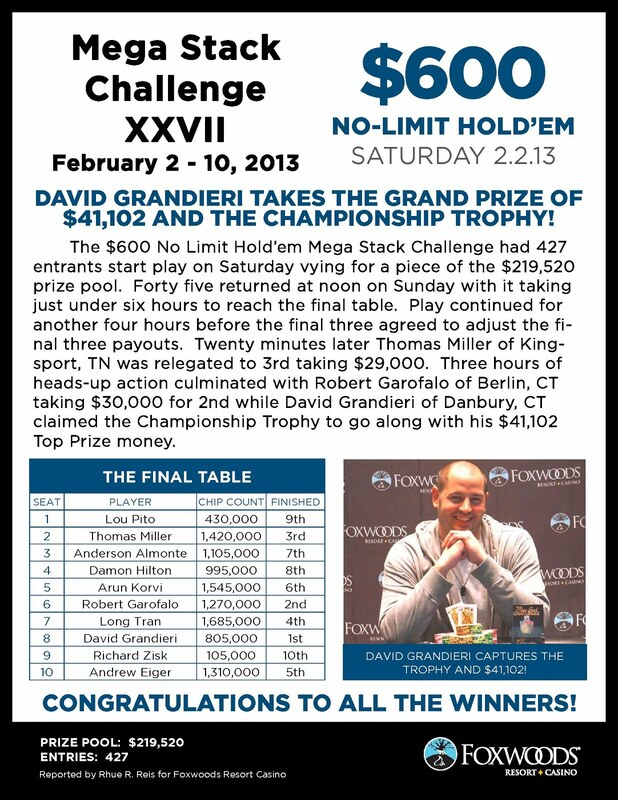 Congratulations to Dave Grandieri, winner of the $600 No-Limit Hold 'em Mega Stack Challenge event. 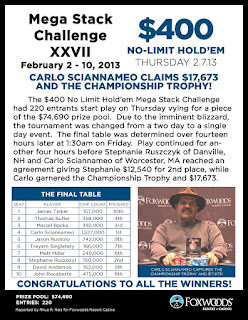 Grandieri takes home $41,102 and the Mega Stack Challenge Trophy! After being crippled down to just three big blinds, Robert Garofalo works his way back to almost three million before getting all-in with [Ad][Qd] against the [Jd][Jh] of Dave Grandieri. The board runs out [Kd][Kh][8s][Th][3c] and Grandieri wins the pot with his pocket jacks. 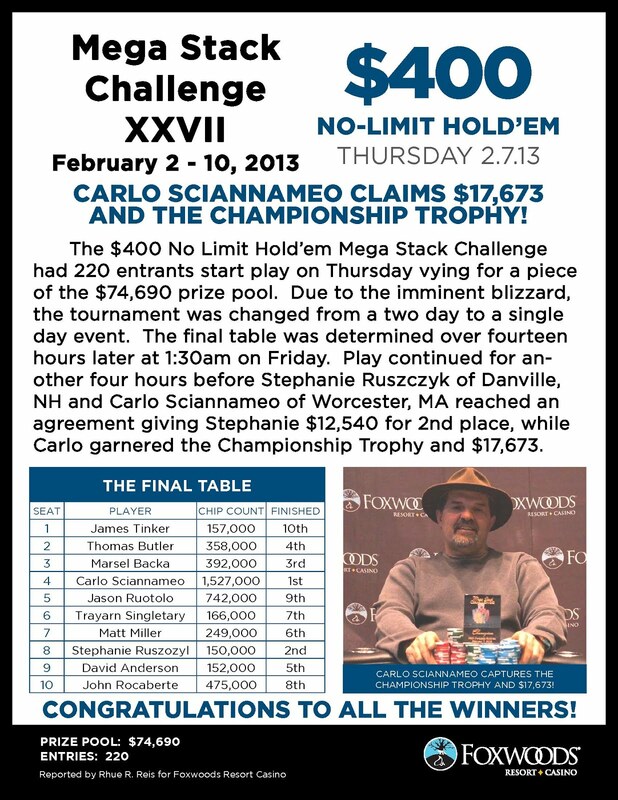 Robert Garofalo takes 2nd place in the $600 No-Limit Hold 'em Mega Stack Challenge. The two players did an additional save during heads-up play and Garofalo officially takes home $30,000. 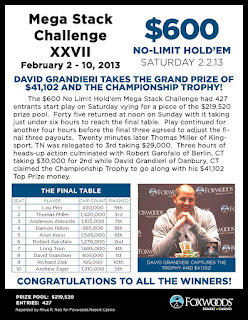 The February Mega Stack Challenge gets underway tomorrow at 11am with the $600 No-Limit Hold 'em event. 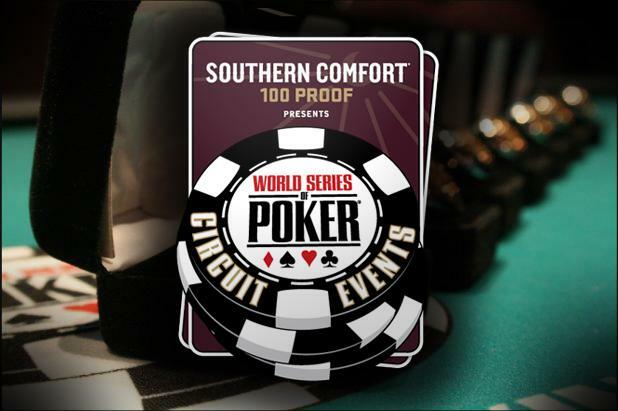 This event features a $125,000 Guaranteed prize pool!